"The number of errors has reduced dramatically which means that our customer satisfaction has increased." Each year Ahlsell delivers 5.5 million parcels in Sweden – a considerable volume with high demands on precision, punctuality and efficiency in logistics. Ahlsell needed a solution that helped them to keep track of assets and to utilise automated loading control. The previous barcode solution used by Ahlsell’s logistics was slow and did not provide enough control for the high volumes. As a result, the company started looking for a more advanced solution that would support high volumes with more accuracy and further automation of the processes. After using internal solutions for a long time, Ahlsell chose to try something external. 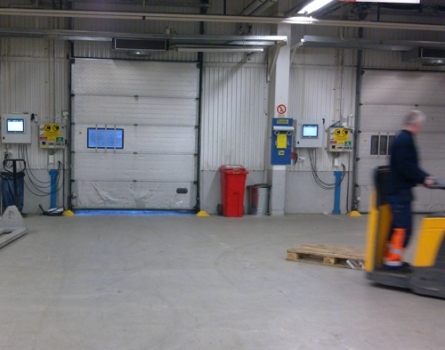 The specific RFID solution that Ahlsell chose was delivered by Vilant and included hardware, software and installation. The automation and efficiency that this system provides, facilitates the handling of large volumes in a controlled manner. Each of Ahlsell’s plastic containers and metal racks is now tagged with robust UHF RFID tags. RFID tags attached to the freight carriers contain a returnable asset identifier developed by GS1, also called a GRAI (Global Returns Asset Identifier) that identifies each load carrier, and makes it easy to follow and track on individual level. The loading gates are now equipped with RFID readers and antennas, which read and verify the tags on the load carriers with the help of Turck Vilant software. This enables automatic loading control by identifying all shipped containers and their intended location. Should a false load carrier pass an RFID gate, the system will trigger a loud sound alarm to eliminate any delivery failures and additional costs. The displays at the gates, show the truck drivers the gate loading window based on an automated loading schedule for each departure. The benefits of the system are significant. The year preceding the RFID rollout Ahlsell had 110 boxes (with packages to several of its customers) sent to wrong destinations. Since the implementation of the RFID system there has only been one delivery error. Today Ahlsell knows exactly how long each asset has been outside the warehouse and if it’s not returned in time, the carriers have to replace them. Ahlsell is a leading and fast growing Nordic trading company of installation products, tools and machinery. It offers a wide range of products and services to professional users in the segments of heating, plumbing, electrical tools and machinery, refrigeration and DIY. Ahlsell suppliers are found in 250 locations in 6 countries. The group has an annual turnover of around 2,5 billion euros and 4,500 employees.